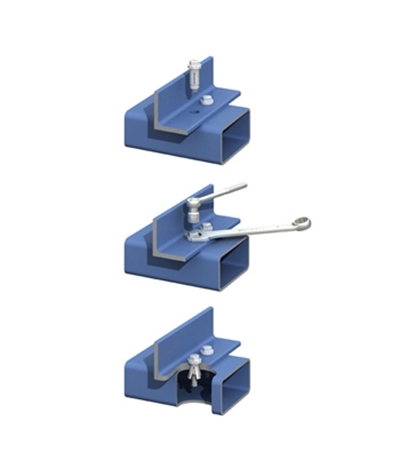 In the late 1940's Lindapter® revolutionised the concept of 'blind' fixing, or where access is available, with the development of the Lindibolt. The idea behind blind fixing is to be able to clamp to something without having to get to both sides of a surface, on many applications it isnt always possible to get to certain areas. Blind fixing is aesthetically a much cleaner way to fix in comparrison to welding or strapping both of which are extremely unsightly, installation is both simple and very quick generally only requiring HSS Drill Bits or Magnetic Drill Bits, a Drill or Magnetic Drill, a torque wrench and relevant size socket. After 50 years of evolution within the construction industry, hollow section steelwork has became the standard. Over that period of time Lindapter have refined their product range and built a reputation for providing excellence in the market of steel fixings.Lindapter over that time refined their position of providing structural steel fixing excellence. Fifty years on from the launch of its predecessor, 1995 marked the year that the Lindapter® Hollo-Bolt™ was launched to expand the range of Cavity Fixings for Lindapter®. The Hollo-Bolt™ is ideal for use on any steel structure, elimiating the need for unsightly welding or strapping, installation is simple and quick requiring only the type of hand tools commonly available on site. Description: The Hollo Bolt collar and head of the grade 8.8 bolt are evident above the surface of the steel section. This head variant is the usual choice for the majority or SHS connections, or where architects favour an 'industrial' look. The zinc plated range is finished with a JS500 protective coating. Description: This discreet midway option has a smaller protrusion the the perfect balance of appearance and convienience, and features a grade 10.9 countersunk socket screw with a special collar designed to accomodate the entire bolt head. Drilling countersunk holes in the steel section is not required. The zinc plated range is finished with a JS500 protective coating. 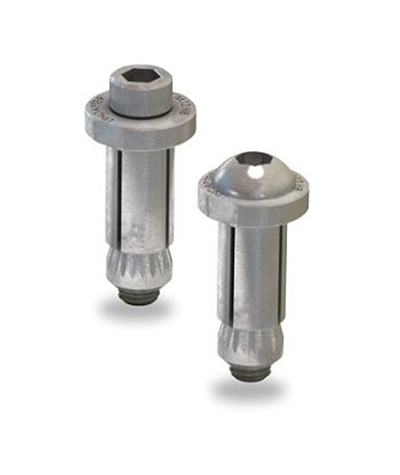 Description:The innovative Flush Fit Hollo-Bolt is entirely concealed within a drilled countersunk holeonce installed, leaving no protrusion above the surface of the steel section. Its the perfect solution for achitects! The zinc plated range is finished with a JS500 protective coating. Description:For the rare connection requirement that an "off the shelf" Hollo-Bolt cannot fulfil, Lindapter's Research and Development Favility has the capability to design and manufacture custom connection solutions. Just one example of a custom Hollo-Bolt is the tamperproof Button Socket Security Head variant, developed for use in prisons. 1. Align pre-drilled fixture and steelwork. Insert Hollo-Bolt through fixture and steelwork. 2. Grip the Hollo-Bolt collar with an open ended spanner. 3. Using a torque wrench, tighten the central bolt to the recommended torque. ICC-ES, a subsidiary of the International Code Council, provides an evaluation service for innovative building products and publishes evidence that products meet technical standards in the form of Evaluation Reports. ESR-3330 is utilized by engineering and construction professionals for using and approving Hollo-Bolt fasteners on construction projects. 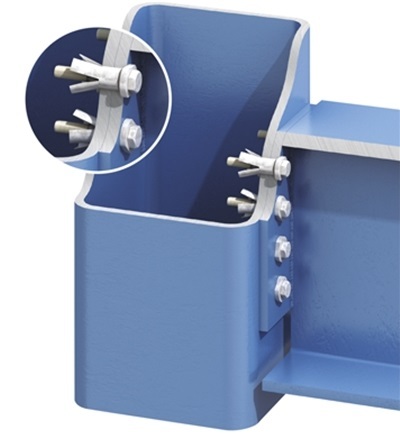 The Hollo-Bolt® is a labor-saving ‘blind connection’ for Hollow Structural Section (HSS) or other structural steel elements where access is restricted to one side. 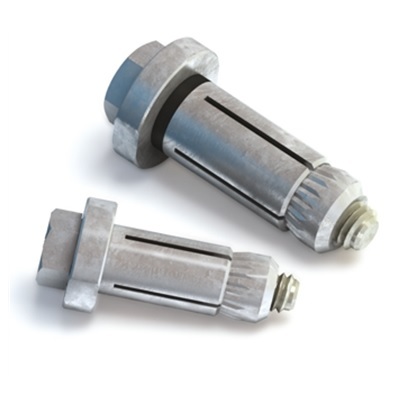 Unlike alternative connection methods such as welding, a Hollo-Bolt is quickly installed by simply inserting the fastener into a pre-drilled hole and tightening with a torque wrench for exceptional convenience, saving the contractor time and money. Product testing was carried out by an independent ISO 17025 accredited test facility and ICC-ES thoroughly examined independent test reports, calculations, quality control methods and other factors. 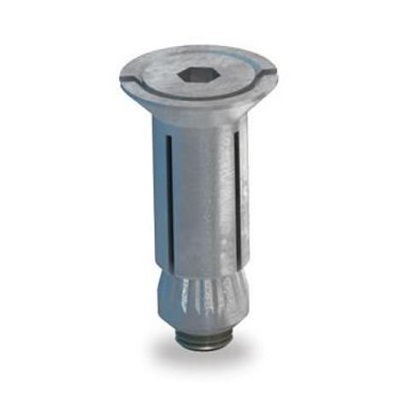 The evaluation, in accordance with ICC-ES Acceptance Criteria (AC437) for ‘Expansion Bolts in Structural Steel Connections (Blind-Bolts)’, verifies that the Hollo-Bolt provides the highest resistance to tensile loading in accordance with AC437 whilst ensuring compliance with the IBC. In addition to validating load data for LRFD and ASD design methods, ESR-3330 confirms that Hollo-Bolt fasteners may be used to resist wind loads and seismic loads in Seismic Design Categories (SDC) A, B and C, giving specifiers additional confidence.